We’ve been thinking a lot about fire lately here at the Ottawa Humane Society. First, our friends at the Wild Bird Care Centre were threatened by the west end brush fires. Of course the OHS called and stood ready to assist with animal evacuation and short-term housing and care for their feathered charges. Then arson struck the currently vacant former shelter on Champagne. The boiler room was broken into, and vandals piled books and papers into it and lit them on fire. Fortunately the Champagne fire was extinguished, and the brush fires were brought under control and birds at the WBCC did not have to be evacuated. Sometimes though, it takes crises and near misses to remind us to be better prepared. The OHS is now working with the WBCC to develop a formal plan to evacuate and house the birds in an emergency. We want to remind you about planning for fire safety for your family and pets. The OHS has always been here to temporarily house animals displaced by fires, but your planning can save lives. 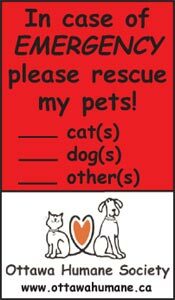 We can also help make your pets safer with door stickers that tell firefighters that you have pets and how many. Drop by, email or call to get your OHS Save my Pets Sticker. And please, have a safe summer!